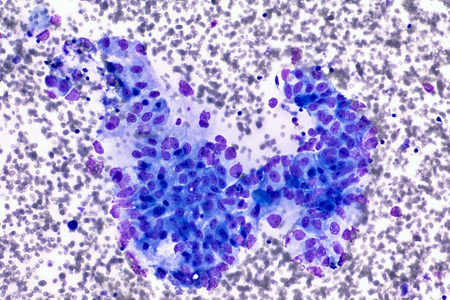 Researchers in China have developed a novel method of identifying patients with early-stage pancreatic cancer. From the bacteria present on patients’ tongues. Pancreatic cancer is diagnosed in 56,770 people in the United States each year and 45,750 people in the U.S die from the disease each year. While pancreatic cancer only accounts for around 3% of all cancer diagnoses, it is responsible for 7% of all cancer deaths. In the UK, around 10,000 people are diagnosed with this highly aggressive cancer each year and the 10-year survival rate is just 1%. One of the main problems is that by the time the cancer is diagnosed it is already at an advanced stage. This is largely due to the lack of symptoms in the early stages of the disease. Early diagnosis is key to increasing survival rates. While several biomarkers have been identified in the blood and tumor tissue, these are associated with the latter stages of the disease and therefore have little use in early detection of the disease at a time when treatment is most likely to work. So how can pancreatic cancer be detected in its early stages if it is virtually asymptomatic? Researchers at Zhejiang University may have found the key. The researchers analyzed the microbiome of bacteria on the tongue and were able to distinguish between early-stage pancreatic cancer patients and healthy individuals. Patients with pancreatic cancer are known to have disruptions to their microbiome in other areas of the body such as the intestine, but this is the first time that changes in the microbiome of the tongue has been linked to pancreatic cancer. For the study, the researchers recruited 30 individuals who had been diagnosed with early-stage pancreatic cancer who were otherwise in good health. 25 healthy individuals were also recruited. All research subjects were aged between 45 and 65, had no oral health issues, and had not taken any antibiotics for three months prior to the study. The team used gene sequencing techniques to analyze the microbiome of tongue coat samples. The researchers found that the tongue microbiome of patients with early-stage pancreatic cancer was substantially different to the tongue microbiome of healthy individuals. Individuals with early stage pancreatic cancer has high levels of Leptotrichia and Fusobacterium and low levels of Haemophilus and Porphyromonas. The researchers have suggested the difference in the makeup of the microbiome is due to the cancer causing changes that influence the immune system in a way that favors the growth of certain types of bacteria. The researchers now plan to conduct a larger study. If the results can be reproduced, this new method of detecting the disease could be used in screening checks and could help to significantly improve survival rates.